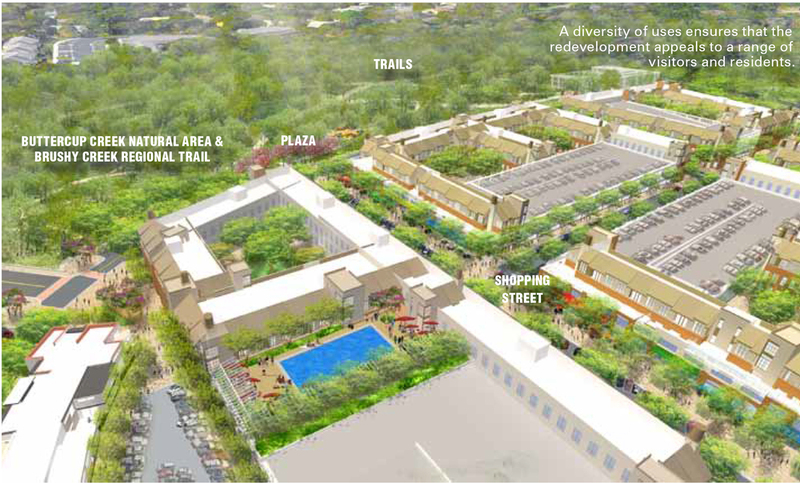 Bell Boulevard/US Highway 183 — Binkley & Barfield, Inc.
BBI, as a sub to Design Workshop (prime consultant), provided planning and engineering design for the development of a revitalization plan for Cedar Park, a growing region northwest of Austin. The master plan, “Destination Bell Boulevard” won the 2016 Vernon Deines Honor Award for an Outstanding Small Town Special Project Plan. Bell Boulevard, also known as US Highway 183, has long been the “backbone” of Cedar Park. As the community has grown and evolved, Bell Boulevard has remained the primary north-south corridor for the city. Once a vibrant community hub, the commercial area has experienced steady decline over the last several decades, thus leaving the community desiring a thriving corridor with a unique identity. Following public input, business owner feedback, contributions from the Bell Boulevard Redevelopment Project Work Group, and data and analysis conducted by the project team, the resulting vision relocates the portion of Bell Boulevard between Park Street and Buttercup Creek Boulevard further east to utilize the existing right of way of Old Highway 183. This approach opens up 40 acres for a connected development and joins up with the Buttercup Creek Natural Area to develop 12 acres with trail and park amenities. The idea is to create an economically vibrant corridor to energize the greater Cedar Park region, while generating a return on investments for the City and private businesses. The vision of this project is to create a gathering place and sense of identity for residents and businesses in Cedar Park, as well as an attraction that can draw from the larger metropolitan area. There are six primary goals for this project that fall within the categories of identity, economics, natural assets and community. Goal 1: Create an economically vibrant corridor and energize the greater Cedar Park region. Goal 2: Generate return on investment for the City of Cedar Park and private business. Goal 3: Work with natural and historical assets to define a more pleasant human experience. Goal 4: Maintain mobility and accommodate traffic levels while increasing access. Goal 5: Gain support from affected stakeholders including land owners, developers and business owners. Goal 6: Solidify what the identity of Cedar Park is through the master planning process. Drainage and road reconstruction alternatives.